NASA is serious about sending astronauts back to the moon's neighborhood and will likely unveil its ambitious plans soon now that President Barack Obama has been re-elected, experts say. 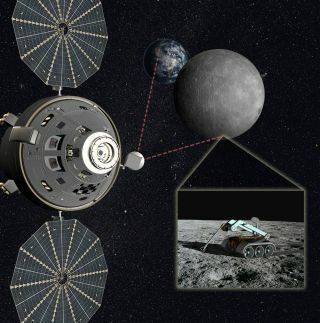 The space agency has apparently been thinking about setting up a manned outpost beyond the moon's far side, both to establish a human presence in deep space and to build momentum toward a planned visit to an asteroid in 2025. The new plans have probably already been cleared with the Obama Administration but have been kept under wraps in case Republican candidate Mitt Romney won Tuesday night's (Nov. 6) presidential election, said space policy expert John Logsdon, a professor emeritus at George Washington University. "They've been holding off announcing that until after the election," Logsdon added, noting that Romney had pledged to reassess and possibly revise NASA's missions and direction. In 2010, President Obama directed NASA to work toward sending astronauts to a near-Earth asteroid by 2025, then on to the vicinity of Mars by the mid-2030s. To reach such deep-space destinations, the agency is developing a huge rocket called the Space Launch System (SLS) and a crew capsule named Orion. But astronauts likely won't head straight to a space rock when SLS and Orion are ready to fly together in 2021. In the last year, word has begun leaking out that NASA wants to explore Earth-moon L2, a point in space that lies beyond the moon's far side, as a precursor. Rumors currently point toward parking a spacecraft at the Earth-moon L2 gateway, so NASA (and perhaps international partners) can learn more about supporting humans in deep space. Astronauts stationed there could also aid in lunar exploration — by teleoperating rovers on the moon's surface, for example. NASA officials think they can pull off such manned missions without busting their budget, which stands at $17.7 billion in the proposed 2013 federal budget. "They're not talking about plans that imply significant budget increases," Logsdon said. "It gives a more focused use for SLS and Orion before an asteroid mission." "I'm not privy to the specifics of this, but one could conceive of the second SLS mission being the start of activity in cislunar space, rather than just being a lunar orbit mission," Logsdon said. We may know soon enough. NASA higher-ups have dropped hints recently that a big announcement may indeed be in the offing before too much longer. "We just recently delivered a comprehensive report to Congress outlining our destinations which makes clear that SLS will go way beyond low-Earth orbit to explore the expansive space around the Earth-moon system, near-Earth asteroids, the moon, and ultimately, Mars," NASA deputy chief Lori Garver said at a conference in September. "Let me say that again: We're going back to the moon, attempting a first-ever mission to send humans to an asteroid and actively developing a plan to take Americans to Mars," Garver added.